Edward Joseph Ball passed away peacefully in his sleep on his 93rd birthday, April 14, 2014, in Gilbert, Arizona. He was born to Mamie and Woodruff Ball on April 14, 1921 in Darbun, Mississippi. Preceding him in death was his wife, Marzetta, a daughter, Cynthia Jo Hancock, a son, Edward J. Ball, Jr., two grandchildren, Rebecca and Nathan Hancock, and his parents. Edward was survived by three daughters and their husbands, Peggy & Jim Jones, Azelene & Greg Allen, and Gail & Jay Armstrong, 16 grandchildren, 44 great grandchildren and 20 great-great grandchildren. He also left behind two sisters, Donnas Plumb and Ina Faye Hodges, a brother, Larue Ball and lots of nieces and nephews. 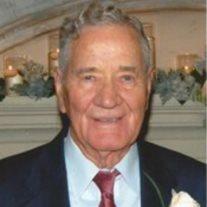 Edward led a very active and industrious life, filled with family, friends, work and golf. He was a WWII veteran, serving with the Army Air Corps in Italy and the Southeastern U.S. After retiring from the Federal Aviation Agency, he and Marzetta loved to travel in their motorhome. He also loved to golf and as he got older, he would proudly claim that he could shoot his age! Funeral services will be held on Friday, April 18, 2014 at 1:00 pm, preceded by a visitation at 12:00 noon at Bunker’s University Chapel, 3529 E University Drive, Mesa, Arizona. He will be interred at the Mesa Cemetery.